The last time I shook Dale Coody’s hand was at the loading dock of the Indian Territory Farms Field Day and Sale in October of last year. There was an anger and a bitterness in his demeanour and commentary that still haunts me today. I can’t help but wonder why our shared passion for a breed can result in such relationship disfunction? As a twenty plus year observer and participant in the meat goat industry however, I have seen it all before. I had introduced Dale to Tye Williamson’s Kifaru sales stock and the reality of their South African authenticity just about the time that NASA was about to be launched in 2003. We were able to secure his charter membership contribution of $300.00 which was critical in our fund raising to enable computer programming for registration under the auspices of the American Dorper Sheep Breeders’ Association (ADSBA). The next time I visited with Dale was in the summer of 2005 when I was safely home again in Canada but my precious Savannah goats were still “stuck in the U.S.A.” due to animal health protocols related to Scrapie and international trade regulations. I had made an unfortunate business decision to house some of my Savannah full blood breeding stock with a Mississippi breeder and hurricane Katrina was pressuring business decisions to sell and move breeding stock to “higher ground”. Precious South African Savannah genetics were at risk. Dale Coody helped me out. He transported my goats to safety and never asked for a dime. The Mincey Goat Farm seminar and Field Day in Cummings, Georgia (2012) was the next time I had a chance to spend a few moments with Dale. Another strong, American, meat goat entrepreneur, Kenneth Mincey was unveiling his new South African (via Australia) imports. Dale was undoubtedly concerned about my personal impressions on the new imports and the direction of the breed. We had conversed on the phone on several occasions outside of the Katrina emergency and he had followed my intuition and suggestions and purchased the Summer Place herd of Erick and Derrick Wilson (heired from Mike Browning but heavily influenced by Keri-Rose embryo transplant participation) as well as the Keri-Rose foundation Savannah herd that I had partnered with Chris Glynos in Connecticut. Dale Coody was the financial partner that I never was able to secure. I gave him insider advice and suggestions that his enthusiasm and dedicated ambition to the Savannah breed made real. The “in-print legacy” of this relationship is the recognition of Keri-Rose (my herd name) in many Goat Rancher advertisements. The only issue that always confounded me and our relationship was his support of Pedigree International over NASA. Like most of us, as we rush with enthusiasm to a new breed, Dale made mistakes. We talked about it. It is irrelevant where these mistakes were made. The travesty is that we have a separated breed as a result. This difference of opinion on where we register our goats is also irrelevant. It pales in comparison to the dedication in time and money that Dale Coody invested in the Savannah breed with hopes of a bright future. I have shared my response to you with other NASA executive members and also with Stephanie Mitcham a supporter of WWSGA. What is the WWSGA definition of full blood? What is their industry vision? What has WWSGA or PI done to promote the Savannah breed and YOUR interests? If you print a pedigree does this mean you have a vested interest in the breed? Where is the PI or WWSGA investment other than a computer? Do you represent the breeders who pay for your paper? Who is your leader? I open my heart to all of you with my concerns and will happily step aside if “personality” is an issue. NASA, the registry, is for sale…reasonable…terms to be negotiated if you have doubts about my ability to progress this breed. Few today appreciate the efforts that have been made to get the breed recognized and to this critical stage in it’s history. Without a fair assessment and understanding of the past, few will understand my sincere concern for a less divided future. Dale Coody should be applauded for his efforts in breed promotion. His big calloused hand was always appreciated. I just hope I don’t walk away with anger and disappointment after more than 20 years passionately defending and promoting the unique performance attributes of Savannah goats. What DO YOU HAVE TO SAY? I invite your comments! While you are thinking, please let me share these recent photos from South Africa. 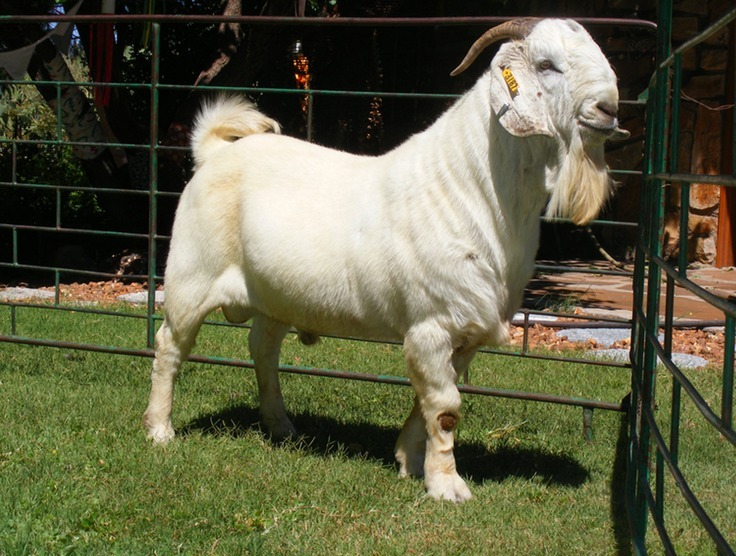 They have been provided to me by my friend, Joe Scholtz, PATRYSFONTEIN Savanna Goat Stud, Griekwastad, North Cape, Republic of South Africa. He shared the most welcome news of his sale of a PERFORMANCE TESTED Savanna Ram (note my Afrikaans respect in terms and spelling but my biased highlights) for 21,000 Rand. 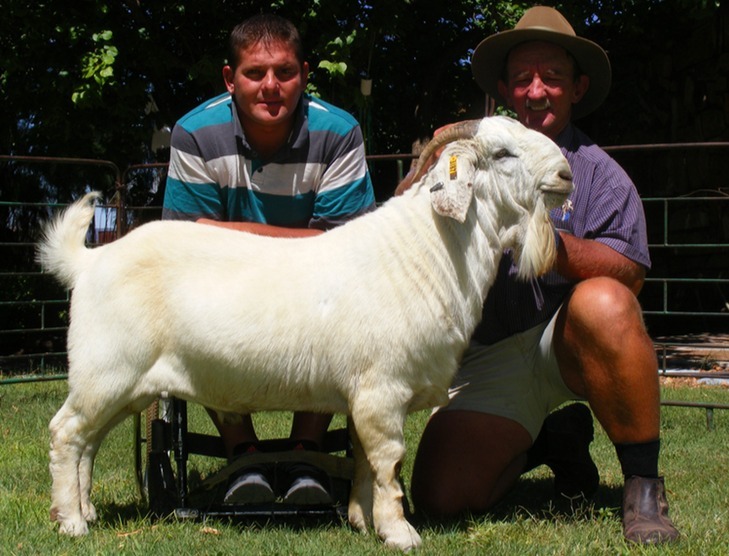 This was the highest ever price for a performance tested Savanna Ram at public auction. He is pictured below with Willem Jansen Van Vuuren (in wheelchair) a new Savanna breeder from Okahandja, Namibia. As you enjoy the magnificence of this breed example, I ask you, Who other than NASA promotes and documents South African heritage? Thank you for your kind words and your recognition of the need to work together to build the Savannah breed. Breeders ARE THE BREED. Their behavior towards one another is an important prerequisite for breed development. Reflections on Direction: Where is the Meat goat Industry Headed?